The Rolex Yacht-Master is one of the brand’s most popular sports model. Prized for its sporty, yet luxurious appeal, the nautical-inspired timepiece is certainly a fixture of the chic sailing-set. Although perfectly paired with a luxury boat, the Yacht-Master is at home on land too. For a big statement, a full gold Yacht-Master reference 16628 undoubtebly fits the bill. 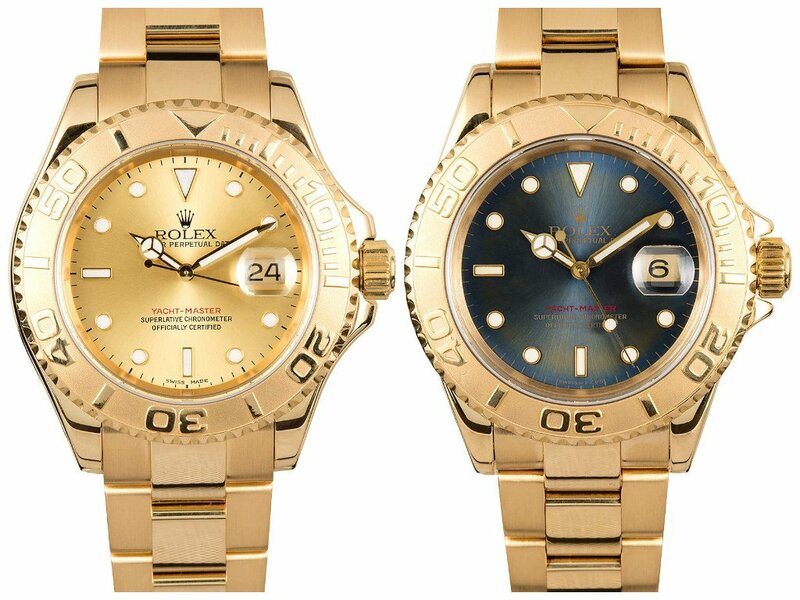 Here we take a look at two solid 18k yellow gold Rolex Yacht-Masters dressed with different dials. The Rolex Yacht-Master 16628 is definitely not a shy watch. 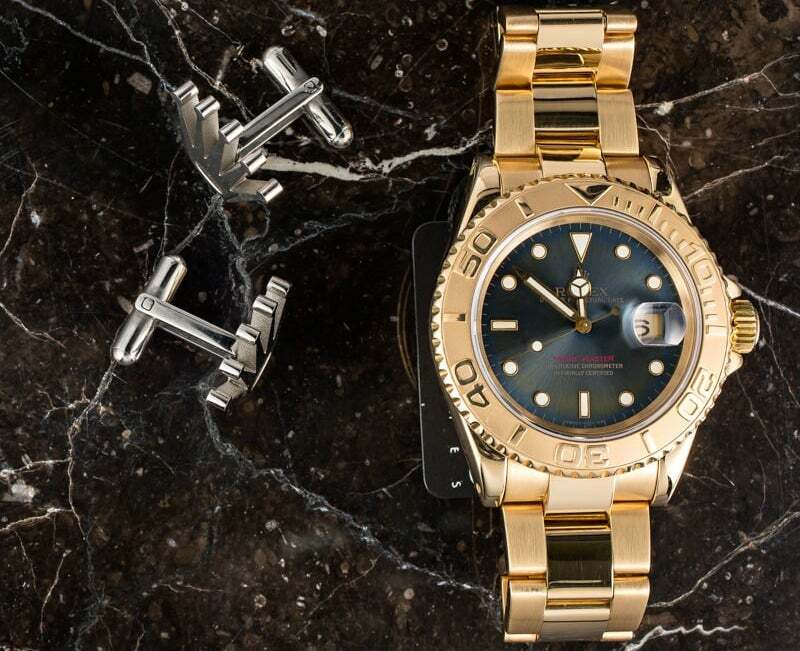 Crafted in 18k yellow gold, from the 40mm Oyster case to the Oyster bracelet to the rotatable bezel, this Yacht-Master can’t help but grab one’s attention. The solid gold bezel with raised numerals marked for 60 minutes allows the wearer to time events — particularly those relative to sailing, such as the time it takes to travel between buoys. Also practical is the date window at 3 o’clock magnified by the Cyclops lens on the sapphire crystal protecting the dial. Although ultra precious thanks to its gold construction, the Yacht-Master 16628 can definitely withstand some rough seas. Its Oyster case is watertight thanks to the Triplock winding screw-down crown, in addition to the fluted caseback. Furthermore, this particular Rolex model can also plunge down to 330 feet (100 meters) if necessary. 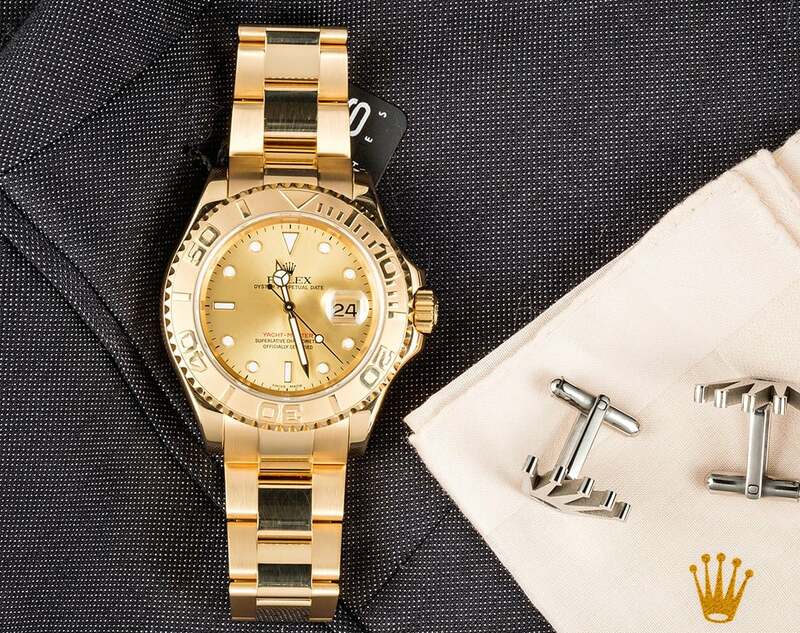 The Rolex Yacht-Master 16628 in full 18k yellow gold was first presented almost 25 years ago in 1992. This particular pair of Rolex Yacht-Master 16628 models showcases two very distinct dials. The first one, dating back to the early 1990s, sports a rich slate blue dial with matching gold flecks. The dark color contrasts beautifully with the bright gold case and bracelet, while also allowing the dial details to pop. The blue background further permits the 18k yellow gold hour-marker surrounds to really shine through. On the other hand, the second version of the Yacht-Master 16628 — this time from 2001 — adds a monochromatic look to the watch by featuring a champagne dial. Perhaps champagne is the more traditional choice for a gold Rolex. 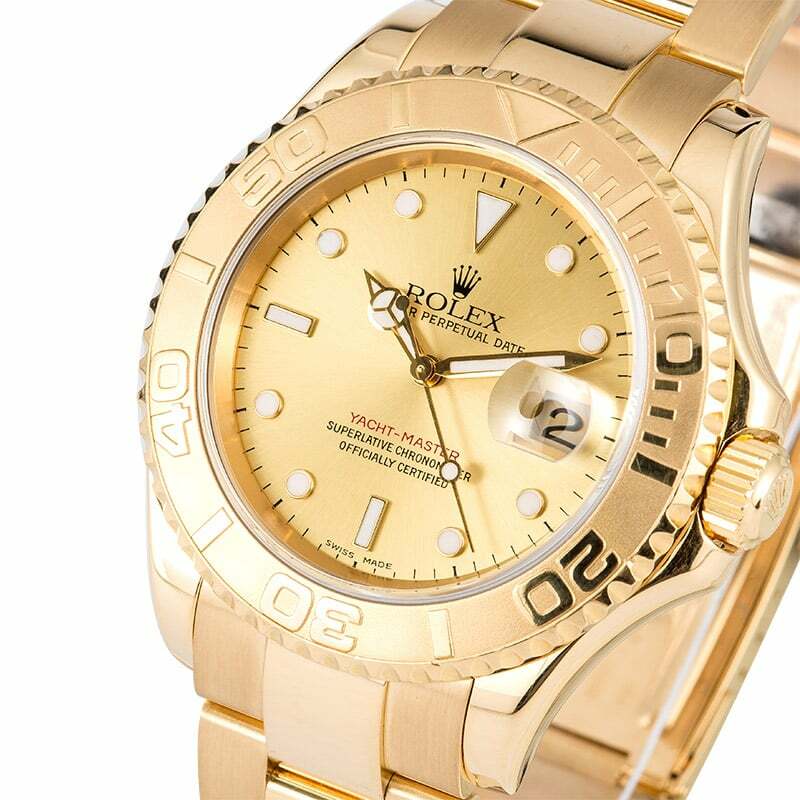 One thing is for certain — no other watch brand can pull off the solid yellow gold look like Rolex can. Moving from its external beauty to its internal mechanics, the Yacht-Master 16628 houses the famous Rolex Caliber 3135. The proprietary Rolex automatic movement is, of course, COSC-certified and has earned its reputation as an ultra reliable, resilient, and precise mechanical caliber. Powering the center hands, in addition to the date function, the Caliber 3135 is one of the most prolific in Rolex’s lineup. Boasting the Quickset and Hacking features, the practicality of the Caliber 3135 is undeniable. If you had the choice between these two excellent Rolex Yacht-Masters, which would become your first mate?